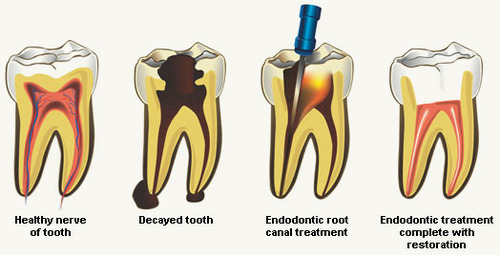 To know about a root canal we have to understand the basic structure of the tooth. The portion of the tooth seen in the oral cavity is called the crown of the tooth and portion which is anchored within the jaw bone is called the root. Depending on the size location and function a tooth may have one or more roots. The tooth has this inner core of soft tissue called pulp. The pulp comprises of all the nerves and blood vessels, which keep the tooth alive. In the crown, the pulp is present within a chamber called pulp chamber and it extends into the root via a narrow tapering canal called root canal. The blood vessels and nerves, which travel through this canal, leave the tooth through a small opening present in the lower end of the tooth ultimately joining with the other major blood vessels and nerves running within the jawbone. Sometimes the pulp inside your tooth becomes inflamed or infected. This can be caused by deep decay, repeated dental procedures on the tooth, a crack or chip in the tooth, or a blow to the tooth.The most common cause is tooth decay. What happens when a pulp gets infected? Tooth decay if left untreated spreads into the substance of the tooth ultimately infecting the pulp. Once the pulp becomes infected with more bacteria than it can handle, it begins to degenerate. As with any infection there is formation of pus, which tends to get accumulated at the tip of the roots within the jawbone, forming a “pus-pocket” called an abscess. This abscess not only causes pain and swelling but also affects the jawbone. 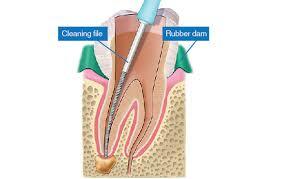 Why is a root canal treatment done? For years, teeth with diseased or injured pulps were removed to prevent or to treat the consequences mentioned above. Today, root canal treatment has given dentists a safe way to save teeth. Based on the results obtained so far it is safe to say that more than 90% of endodontic cases respond to root canal treatment. If carried out.